Don Tudor | Galion Inquirer Northmor’s Blake Miller records one of his six blocks on the evening, this one against the Eagles Cameron McCreary. The hosting Golden Knights would outlast the visiting Colonel Crawford squad in OT; 66-63. 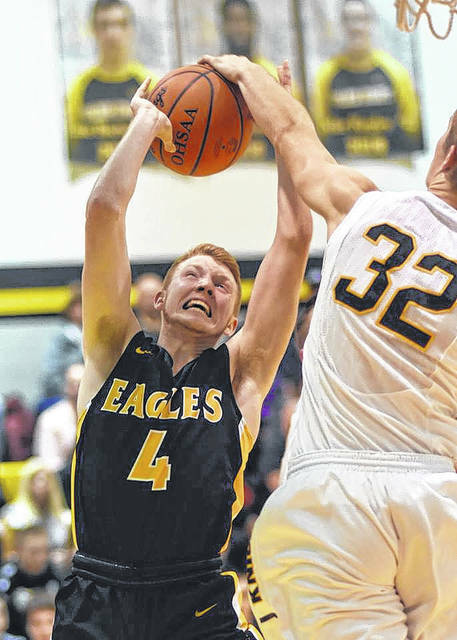 GALION — On Wednesday evening, the Northmor High School gymnasium was flooded with a sea of black and gold as the Northmor Golden Knights played host to the Colonel Crawford Eagles in boys, non-conference basketball action. The stands were packed and the “standing room only” crowd extended out into the cafetorium as two of the top teams in the area duked it out for 36 minutes. When the clock hit zeroes in overtime, it would be the home team emerging victorious over their visiting foe; 66-63. With the victory, the Golden Knights now move to 3-0 on the season and the Eagles fall to 1-1. From the opening tip, the game provided the excitement, energy and scrappy play that one would expect from both teams. While both teams tried to figure out how to handle each others speed and size, the first quarter came to a close with the score knotted at 17 points apiece. The break between quarters gave the kids a momentary rest and allowed the coaches to map out the game plan moving forward. Crawford coach David Sheldon appeared to have his opponent figured out in the second as the Eagles held the home team to just seven points while tacking on an additional 14 to their score to head into halftime up; 31-24. At the half, Colonel Crawford’s Cameron McCreary led all scores with nine points while Northmor’s Blake Miller was right behind him with eight. Crawford held the shooting edge at the half, shooting at a 10/20 clip, including 4/8 from three-point range. Northmor was 10/25 at the intermission and just 1/11 from the perimeter. To begin the second half, it was all Eagles. Crawford would stretch their lead to 13 points with just two minutes remaining in the third frame and would march into the fourth with an eight-point advantage; 46-38. In the fourth, the energy of not only the teams but the respective crowds brought new life to the contest. Northmor, trailing by eight, went to a full-court press to try and prevent the Eagles half-court offense from getting a chance to setup. It would prove to be a smart strategy by Northmor head coach Zach Ruth, creating errors which turned into offensive opportunities. The Knights would capitalize on their flustering of the Eagles offense and go on to outscore the visitors 16-8 in the quarter to send the game into overtime at 54 points apiece. Northmor would dig deep for contributions in the extra frame as “The Trees” also known as Tyler and Kyle Kegley had fouled out before the end of regulation. Crawford would have to deal with some foul trouble as well but would survive the game with no one fouling out. Strategic timeouts, constant barking and dig-deep hustle throughout, it would be the home team coming away with the win as McCreary’s double-clutch, buzzer-beating attempt between two Knights defenders rimmed-off to secure the game. McCreary would lead Crawford in scoring with 20 points to go along with five rebounds, an assist and a steal. Harley Shaum, who spent most of the first half on the bench in foul trouble, also finished in double figures with 14 points as well as five boards, two steals and two blocks. Other Eagles stats Wednesday were: Team- 21/41 (51%) total field goals, 6/19 (31%) from the perimeter, 15/21 (71%) from the free-throw line, 29 rebounds (6 O, 23 D), 7 assists, 9 steals, 2 blocks and 17 turnovers; Jordan Fenner- 9 points, 5 rebounds, 4 assists; Brody Martin- 8 points, 2 rebounds, 1 assist, 1 steal; Hayden Bute- 6 points, 3 rebounds, 1 assist; Reis Walker- 3 points, 3 rebounds; Zye Shipman- 3 points and Chase Walker- 3 rebounds. For the Knights, it was Brock Pletcher leading the scoring attack with 22 points to accomodate three rebounds, two assists and three steals. Meechie Johnson netted 19 points on the contest as well as five rebounds, two assists and two steals. Blake Miller had a big game on both sides of the ball for the home team, scoring 12 points while grabbing six rebounds, an assist and amassing six blocks. Other Knights stats were: Team- 23/53 (43%) total field goals, 3/20 (15%) from the perimeter, 17/27 (62%) from the free-throw line, 28 rebounds (12 O, 16 D), 6 assists, 13 steals, 8 blocks and 14 turnovers; T. Kegley- 5 points, 2 rebounds, 1 assist, 1 steal, 1 block; Eason Neal- 4 points, 1 rebound; K. Kegley- 2 points, 7 rebounds, 1 steal, 1 block and Lane Bachelder- 2 points and 4 rebounds. Colonel Crawford will begin their Northern-10 Athletic Conference schedule on Saturday, December 9 when they welcome the Carey Blue Devils to Mac Morrison Gymnasium. For Northmor, it will be a Knox-Morrow Athletic Conference clash, at home, on Friday, December 8 against the Fredericktown Freddies. https://www.galioninquirer.com/wp-content/uploads/sites/38/2017/12/web1_Miller-blocks-Cam.jpgDon Tudor | Galion Inquirer Northmor’s Blake Miller records one of his six blocks on the evening, this one against the Eagles Cameron McCreary. The hosting Golden Knights would outlast the visiting Colonel Crawford squad in OT; 66-63.